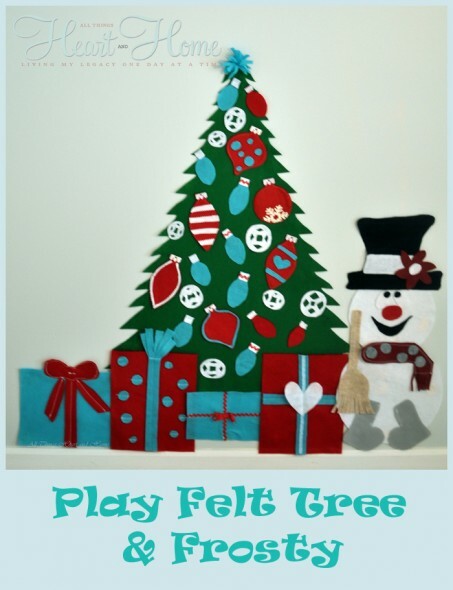 Play Felt Christmas Tree &Frosty! This idea is all over blog-land and I thought it would make the cutest addition to the playroom! I knew the babies would love it but what I didn’t expect is that I had SOOOOOO much fun making it! Remember those felt boards in Sunday school? I loved learning about Moses and Joseph and David while watching the story unfold on the teacher’s felt board! Anyhoo, in case you forgot…felt sticks to felt…how easy is that?! At Hobby Lobby, you can find some felt ornaments, those are the larger ornaments you see on my tree. I added some contrast to the ornaments I bought and made some other ornaments for the tree. And since all my tiny girls LOVE Frosty the Snowman, I did my best to give them Frosty! 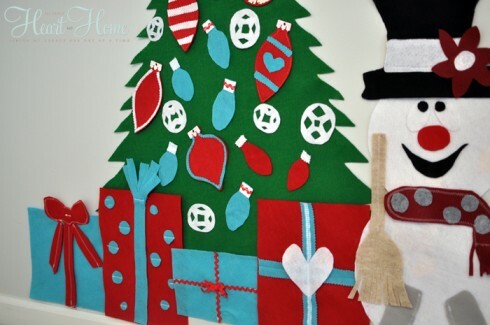 I used the heavier felt on bolts for the tree and the snow man, then just used the thinner felt pieces for all the fun stuff! It doesn’t take much felt. The tree measures about 30″ X 29″ and I just eyeballed the white felt for Frosty and guessed. It depends on how big you want the jolly happy soul to be! And you could certainly make it easier by simply cutting a triangle for the tree and avoid the fancy cuts! This project was super-duper easy and took only a couple of hours! The original source for this adorable project was: Johnny in a Dress! Thanks for the great idea Natalie! 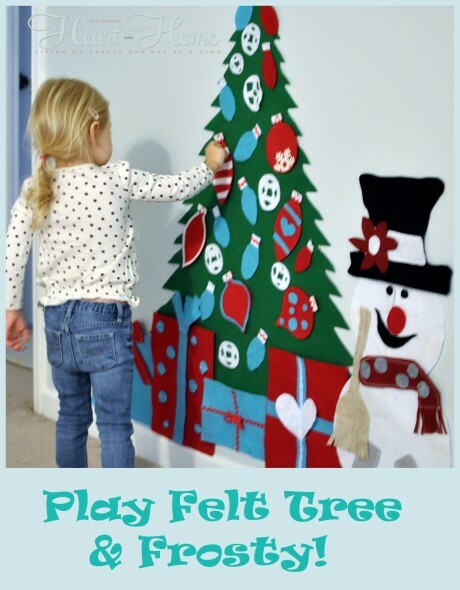 « Stenciling in the Playroom & A Giveaway from Cutting Edge Stencils!!! How stinkin’ cute is that?!?!?!? Just adorable. You are so creative, Robin. How did you affix it to the wall? Simply a-dor-a-ble! Love it, love it, love it. Wonderland in your playroom!! Very cute! How did you attach them to your wall? Sue, soooo sorry I didn’t tell you guys! I used masking tape! Robin you make the best stuff! Love it! oh robin ~ i love you! a) bringing forth this awesome idea that i am going to make for our ‘adopted’ granddaughters who live down the road ~ they would love this so much!! b) introducing us to ‘johnny in a dress’ ~ so sweet! thanks, thanks for your gifts, always. what i don’t get is how you get the tree to stick temporarily to the wall. This is super adorable. 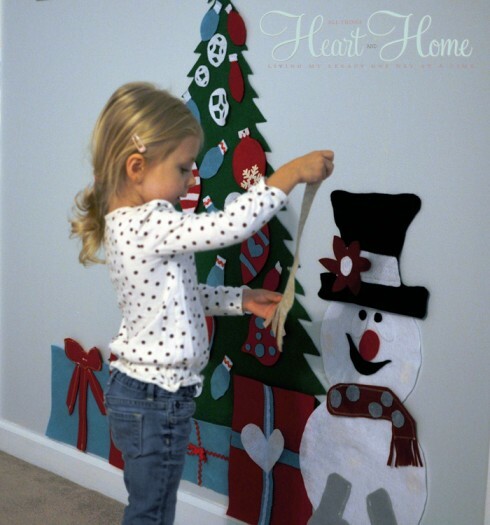 One thing – how to you get the tree base and the snowman base to stick to the wall? Do you have textured walls or flat surface? My walls have that orange peel texture… I love this idea. So great! Robin, that is so cute! Too bad all my grandkids are too old for that because I would make the scene in a flash. 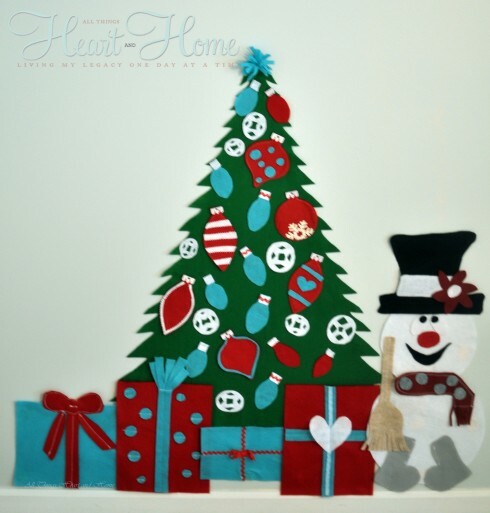 Did you use templates to cut out the ornaments and frosty and all the details? Do you have a pattern for the tree? It looks so perfect and mine will NOT come out like that without a pattern. This might just make a brilliant advent calendar as well, if I could just take the ornaments and make them into pockets instead of just ornaments?! Looks great in any case! This is adorable! 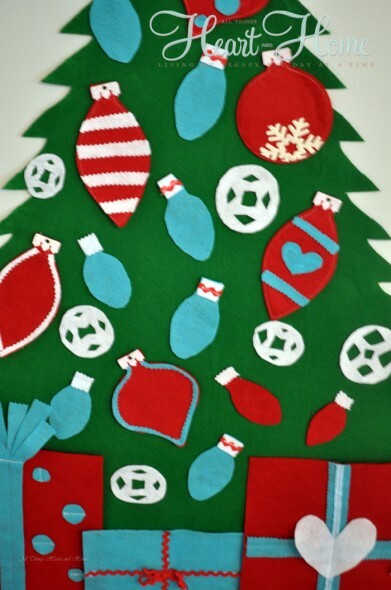 Where did you get such a large piece of felt for the tree? Hi… just wondering what type of felt you used? was it a wool blend? I plan on making these myself but am worried that the felt won’t stick to itself unless it’s a certain type? Where did you find the felt in big sheets?